How much does obesity cost the United States? See the following infographic for details. It highlights work and health care costs by state, as well as comparing the states to one another. Alaska is a leader in obesity – perhaps its to cold to go out and do anything, or people need the extra layers for warmth. 😉 What other area is right up there with Alaska on the leader board? Washington D. C. … no doubt some politicians and greasy lobbyists are living high on the hog. Click on the mini-snapshot image below to open up the full extended infographic in your web browser. It is only natural for northern people to be slightly heavier than southerners. This is because those in the south generally get energy from the sun so they need less of it from food sources. Very interesting statistics. That’s a high percentage for health care costs. Wow! Marina is probably right about the southerners. The warmer climate allows for more outdoor exercise too. That’s interesting that colder places have higher obesity rates. I live in Seattle and I do notice quite a large number of overweight people. I am glad that Arizona has the lowest percent of obese people! !I am living in Arizona now..The weather here is quite hot! !We go to gym everyday to have some work outs! !People in cold place do not want to go out because of the cold weather..lol! !Interesting topic!! I live in Arizona and any trip to local warehouse store will showcase the large amount of overweight people here. Interesting thought, but if high heat burned fat I would open a Fat Loss clinic. Alaska did not use to be like that. I believe the western diet which replaced the traditional diet is the primary cause of the epidemic. I just came across a scientific study on the economic burden of obesity. The study titled “The economic burden of obesity worldwide: a systematic review of the direct costs of obesity” ( can be found at http://www.ncbi.nlm.nih.gov/pubmed/20122135) shows that obese people spend on average 30% more than their normal weight peers on medical costs. I noticed that since I was little, growing up on the east coast. When winter would hit I don’t think I knew one person who did not gain at least 1-5 lbs. during the cold months but once spring came around most of us would go back to our normal weights. It is sad to think that so many health issue’s are from being overweight. Motivation and some encourage make it possible to get on track to losing weight. I know I’ve done it. I like the information you have on the blog. Being well informed also helps. I think the sun just puts you in a better more energetic mood! The society makes me fat. I am still nowhere in finding interesting article with that title, haha. the point is, from what i have read, The instant culture is probably (not trying to judge anyone here) the reason of obesity in US. I mean in the big city we could get corn syrup and burger easily anywhere and it is cheaper than buying organic food. Though it is never too late to be healthy, most people uncomfortable about changing lifestyle, if only all aspects of those obese people encourage him to do so, it will be more effective than having diet aides (not aids :D). Nice jokes about Alaska though and nice content too. I love surfing through your article. Keep up the good work! Most of the people are victim of junk and fatty foods and changed lifestyle.These are the main reasons for increase in obesity. During all of the discussion on the health care reform bill, I heard very little about the effect of obesity on health care costs. I wish our health care system focused more on preventing illnesses, not just treating illnesses, by educating and motivating people to lose weight and live healthier lives. I wish our health care reform would cover EVERYONE, not just more than what have coverage now. I also really wish they put something in it about helping people who are overweight lose the weight. It seems they do a lot of research on how much we overweight people cost, but they don’t seem to do anything else. Their has to be some kind of a change in this country! We are getting bigger and bigger, I think that eating healthy starts in the home and then the schools. Have you seen how healthy our kids are eating these days at school, it’s a joke! I agree with Jim. 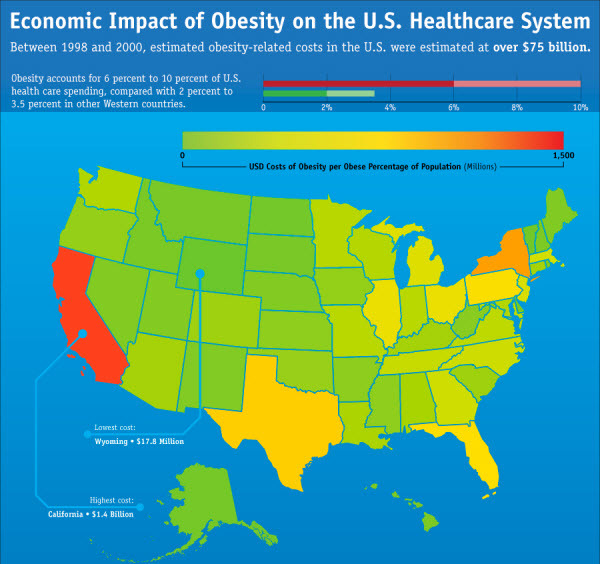 No one is talking about obesity and the effect on health care costs. It’s as though we’re afraid to say the truth. If we’re fat, overweight and unhealthy we have more health problems and we spend more on health care. My goodness it’s amazing how many people are taking obesity for granted. The middle aged folks like me are getting fatter but what really concerns me is the rise of obesity I see among children. Thanks for writing about this. The word needs to be spread. Very interesting. Somehow we need to get a handle on this. I guess it starts with parenting? It’s unreal and very very scary. I’m in the UK but we’re facing the same problem and catching you up. Our kids are eating poorly, exercising less and it’s only going to get worse. That’s why we need blogs like this to help people keep on top of their weight,their size and their long term health. I live in New Brunswick Canada and from what I have seen here and other places I go across our great country obesity is everywhere. It used to be that I would only see over weight adults who had years to pile on the weight but today it’s in our kids as well. It’s very sad to see our country going this way. As parents we have a responsibility to teach our kids better eating habits. It really is an epidemic, considering the how rampant it is in the US and how much each state allocates health funds for obesity alone. I agree that it is affected by different factors – climate, lifestyle, choice of food or even personal physiological and psychological factors like slow metabolism and stress. We’ve been through all sorts of diet, we lost weight yet after some time we binge-eat and get those unnecessary pounds again. What we need is not just going to the gym and shape up but a comprehensive weight loss counselling. It is something that we should start to personally consider to keep that desired weight for life. Did you know that U.S. citizens were experiencing apprehensive about the condition of obesity. Unfortunately, from obesity continues to diseases such as cholesterol, heart attacks, and other diseases. As a country with a level of living standard and high medical nan does not appear to affect the U.S. ability to overcome these problems. Based on data from the World Health Organization (WHO) in 2005, the U.S. Men at number 83 the average cholesterol level, while the daughter is ranked 81. Average both men and women containing 197 mg / dl. Note that spelled bad and risky. For comparison, Colombia, as the country with the highest cholesterol risk notes recorded in the blood cholesterol level 244 mg / dl. The figure is far worse than Israel, Libya, Norway and Uruguay, which recorded a cholesterol level 232 mg / dl. Their does need to be something done about the large obesity problem in the U.S. I think that it first starts at home. We need to start teaching our kids a better eating habits. If we don’t do something soon it’s going to get worse and worse. We all have to do our part! Just wanted to say Thanks for your info-have visited a few times. Would like to let you know that keepin the sodium down in your diet is important too. There are some GREAT seasonings that you can use on the grill-to save time in the kitchen-that have no salt or sugar! Enjoy and keep up the good work! Obesity isn’t limited to the U.S., we here in Canada have a huge weight problem and it’s growing daily. Personally I was heading to obesity at 80 pounds over weight but my son snapped a picture of me in my under wear and I got so angry and embarrassed, but it made me think hard about where I was heading. I started to walk and workout a bit. I dropped off about 60 pounds. I am still working on the last 15 or so pounds but my heart gave out before I could completely get rid of the extra weight. I am pretty sure that if I had my heart attack while still 80 pounds over weight I would surely be dead now. Today you can not go outside in our city without seeing people that are obese and like me they just haven’t come to the point where they are ready to do something about it. Perhaps they need someone to snap a picture of them in their underwear, it worked for me. I think obesity is know an epidemic. It is really getting out of control. I believe it is because individuals are not eating healthy and exercising regularly. I would think that schools should play an active role in regulating the amount of fatty food they sell in the canteens. Give more choice of healthy food to children so that they are not stuck with the same old pizzas, french fries and other fatty stuff. We are an instant gratification generation, and food is no different. We may know what we are eating isn’t good for us but we say and think, “ah, how much can you meal hurt” The problem is one turns into hundreds. People need to know they can still have bad foods and lose weight. It just has to be one day of splurging a week and use the other six days to burn fat. When our diets are too restrictive we fail, and when we starve ourselves to lose weight we fail once “starvation mode” kicks in. The mainstream media and even doctors just do not know the real issues with obesity. Getting fat is in our genes, literally. We gain fat for survival reasons and losing fat goes against our bodies survival instincts. I’ve lost 120lbs after struggling with weight my whole life. I wasn’t able to do this until I really took the time to learn about my body and the food I was eating. Knowledge is key!!! I also think that it has a lot to do with the fastfood companies. I Germany you just dont get 1 Liter Coke and mega portion of fries with a fat burger for 5 Euro . The maxi menue at mc in germany is just a medium or small menue in the US I think. But that has also something to do with expectation of the consumer. The bigger and better mentality is not helpful in this case. I believe the problem with our US Diet is the fact that we have so many different options to eat! In other countries your are limited to only a few. We’re just to spoiled in America. Obesity is a large problem in the united states because of the high consumption of sugar. People need to understand that sugar can cause obesity. What is not mentioned is that the most obese states in the Union (Mississippi, Alabama) are the ones with the highest rate of food stamp usage. There is a direct correlation between the use of EBT cards and obesity. The US government preaches about eating right and getting proper exercise, yet is the biggest enabler to people overeating!! More big government at work!!! In the last twenty years, the number of obese children between the ages of 6-11 has tripled in the United States. For teenagers, those numbers are even worse. Beyond lowered self esteem, overweight kids face serious health risks that are likely to follow them into adulthood, problems that tax not only their bodies, but the entire healthcare system. In Connecticut, an estimated $856 million dollars are spent each year on adult health problems attributable to obesity. Not everyone is aware how bad this is and we need to help educate these young children. Trying to Lose weight is not an easy task! you need will power and lots of patience, but all the little things count, like taking the dog for a brisk walk going for a run through the park, or things like not having that 2nd packet of crisps! It is really an epidemic when you look at the size of the children in this country. A lot of people say they need to exercise and eat right but it is very difficult depending your circumstances. I notice a lot of overweight adults who are passing on their bad habits to kids. Socio-econmic issues play a huge factor as well which is another issue. These days children don’t exercise and everything is technology based. Kids are on the cell phones, internet, or video games but not outside walking and exercising. If you look at other countries you just don’t the overweight issues and diseases people suffer from being malnourished. We really need to solve this problem. I see teenagers having diabetes, hypertension, and sleep apnea. We need to wake up. Nice post.. and a detailed analysis about the research.. I like the way you write. I do believe that there is a link between the weather and obesity. I think this map would be far more informative if it were done on a per capita basis. By just doing total cost you are basically looking at population data.